The gourmet salad hut is a family run business owned by Rob and Narelle Andrews. They have been farming at Burringbar for 25 years and sell all of their produce at farmers’ markets around the area. Being local residents the Caldera Farmers’ Market is very important to them as they love supporting and talking to the local community. They have many varieties of lettuce, herbs and other Asian greens to use in the most delicious salads and to add exciting flavours to other meals. Most market days you will meet one of their daughters Abby or Emma who are very knowledgeable about how their salad greens are grown and what to use to create exciting flavours. 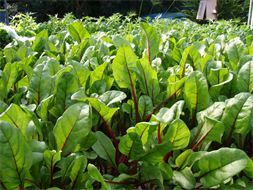 Crops grown all year include coriander, chard, fancy lettuce, mixed salad leaves, mizuna, pac choy, kale, parsley, rocket, tatsoi, watercress, seasonal basil and dill. Narelle also makes jams, pickles, relishes & delicious passionfruit, lemon and lime butters from produce grown on their farm. Another specialty is pesto made fresh from the garden.